Luxury Condo, Premium Location, Best 1 & Den Layout In The Building! Don't Miss Seeing This One! Den Has Been Converted Into 2nd Bed W/Closet & Sliding Door. Floor To Ceiling Windows, Sleek Engineered Wood Floors. Large Open Balcony! Open Concept Kitchen With Granite Counters! 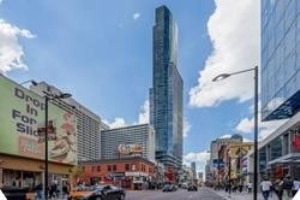 24-Hr Concierge, State Of The Art Fitness Club, Guest Suites, Sauna, Visitor Parking, Steps To Subway, College Park, U Of T, Hospitals & Financial District. Price Incl 1 Parking Space. B/I S/S Oven, Cooktop, Dishwasher. B/I Dishwasher & Fridge Have Custom Wood Panel Front, S/S Microwave, S/S Designer Hoodfan, Stacked Front Load Washer & Dryer, Mirror Closet Doors In Br, All Electrical Light Fixtures & Window Blinds.